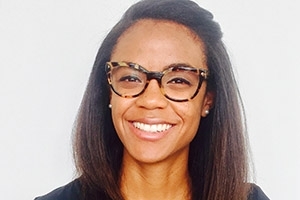 Jessie Smith joined the Strategic Communication MA program at American University (AU) with a goal to made a jump from a successful career in scientific research to health communication. At AU's School of Communication (SOC) she found a mentor who helped her build the network she needed to do it. Smith had always wanted to go to medical school and although she found the communication field interesting, she found comfort in the concrete career path of the sciences. After graduating from Tulane with all her pre-med credits, she embarked on her medical journey and got a job researching the effect of stress during pregnancy on the neurodevelopment of babies. The research was interesting to Smith, but she wasn't satisfied. She wanted to "be part of the next step… I wanted to get the opportunity to form the messaging because I knew [the patients]. I wanted to be involved beyond the research and the data." In the fall of 2015, the Ebola outbreak was a huge issue on the news. Smith became very angry at the way the disease was being communicated to the public. "I thought the entire continent of Africa was being stigmatized, as usual, for an outbreak that was very northwestern. There was that never-ending rhetoric of 'the other', like 'we are the west and we are safe, smart, trustworthy and intelligent, and they are the other and therefore we can't trust them'. This rhetoric came from a number of media outlets and it was so sensationalized." So she decided to apply to graduate school, so she could contribute to the broader conversation in a positive way. Through her relationship with her mentor, Diane Weiser, head of corporate communications and investor relations at Cytokinetics, a biopharmaceutical company in San Francisco, Smith says she was supported and reassured every step of the way during her time at AU. "She was so approachable from the very beginning. I was so impressed with her. She is so humble and told me that anyone who works hard can do what she was able to do. She told me that she has had a lot of great mentors in her life," she said. "The SOC Alumni Mentor Program connects students with successful alumni who are able to expose students to the realities, challenges, and rewards of working in the field of communication. I have seen this program build student confidence and their self-esteem in a way that inspires their academic work and professional ambitions," said Jeff Rutenbeck, AU SOC dean. Weiser helped Smith with her resume and cover letter, optimizing it for the field of communication, rather than medicine. Then Weiser connected her with companies in the health communications field. "She selflessly emailed four or five VPs and CEOs and she attached my resume and told them about me. She made me sound great and asked them to take the time to set up exploratory interviews with me about summer opportunities." Shortly thereafter, Smith would receive emails from these firms' HR departments. Smith is grateful for Weiser's assistance, knowing how competitive internships are and how important it is to have a respected person advocate for her. "That's just the luck that fell into my lap[…]. She got me calls with Spectrum, Ketchum, W2O. I've been in touch with these firms in a positive way. When I sent applications to other firms, she tried to find people she knows there. It's been wonderful." Weiser was the first person Smith contacted after receiving her first of many internship offers, even before her friends, family or boyfriend. "Before I even opened the email, I contacted her. She was so excited for me. That's just the relationship we have. She has been an integral part in helping me in the student and professional space. I am indebted to her forever and she is happy for our relationship to continue past this mentorship program. I just feel like someone is in my corner. She has been so unbelievably helpful and kind. I don't forget for a second that I have these opportunities because of her." Smith started a summer fellowship at Ketchum in June.